Peter Smith Pub Inc. Hardcover. 0844672955 Like New Condition. . Fine. Peter Smith Pub Inc. Hardcover. 0844672955 New Condition. . New. 1988-11-01. Good. Ships with Tracking Number! INTERNATIONAL WORLDWIDE Shipping available. May not contain Access Codes or Supplements. May be ex-library. Shipping & Handling by region. Buy with confidence, excellent customer service! Peter Smith Pub Inc, 2006-06-30. Hardcover. Good. New York, New York: Simon and Schuster, 1988. Light rubs at lower corners and lower edges of boards, slight fade to tail of spine, slight yellowing of edges of text block. No prev. owner name. DJ with slight rub at corners and ends of spine panel. DJ in plastic cover with price corner intact. Illus. with B&W photos. Signed by Taylor Branch with signature only on the title page. The first volume of the "America in the King Years" trilogy. Winner of the 1989 Pulitzer Prize for History. Incl. Abbreviations Used in Source Notes, Notes, Major Works Cited in Notes, and Index. (xii) 1064 pp. Heavy book.. Signed by Author. First Edition, 1st Printing. Hard Cover. Very Good/Near Fine. Peter Smith Pub Inc, 2006-06-30. Hardcover. Used:Good. Riverside, New Jersey, U.S.A.: Simon & Schuster, 1988. First printing. Quarter navy cloth, navy boards, gilt titles. Near fine with a couple of faint waterspots to foreedge. DJ in Mylar also near fine with one small chip to lamination at bottom front panel. 1064 pp.. First Edition. Hardcover. Near Fine/Near Fine. Book. Parting the Waters : America in the King Years 1954-63. New York: Simon and Schuster, 1988. First edition of the first volume in the author's trilogy regarding America during the King years. Octavo, original half cloth, illustrated. Inscribed by the author on the title page, "For Joe Burke, with best wishes Taylor Branch 1/31/90." Fine in a fine dust jacket. 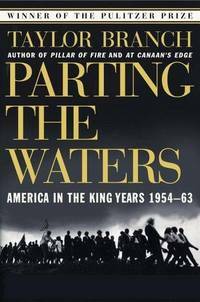 Parting the Waters: America in the King Years, 1954-63, is the first book in the trilogy, regarding the King years. Events detailed in this volume include the Montgomery Bus Boycott, the 1961 Freedom Rides, the 1963 Birmingham campaign and Children's Crusade, and the 1963 March on Washington for Jobs and Freedom. It shared the 1989 Pulitzer Prize for History with James McPherson's history of the American Civil War, Battle Cry of Freedom. It also won the 1988 National Book Critics Circle Award for General Nonfiction, and was a 1989 finalist for the National Book Award in the Non-Fiction category. U.S.A.: Peter Smith Pub Inc, 2006. Brand new book, still sealed in publisher's shrink wrap.. Not Indicated. Hard Cover. New/New. 1989-08-03. New. Ships with Tracking Number! INTERNATIONAL WORLDWIDE Shipping available. Buy with confidence, excellent customer service! 1989-03-09. Good. Ships with Tracking Number! INTERNATIONAL WORLDWIDE Shipping available. May not contain Access Codes or Supplements. May be ex-library. Shipping & Handling by region. Buy with confidence, excellent customer service! Parting the Waters: America in the King Years 1954-63. NY: Simon & Schuster, (1988).. First edition.. 1064 pp w/index. Very near fine in like dust jacket. Promotional flyer and review slip laid in. NEW YORK NY: SIMON AND SCHUSTER. FINE IN FINE D.J.. PUB 1988. FIRST EDITION. HARDCOVER. WINNER OF THE PULITZER PRIZE . BOOK IS FINE WITHOUT ANY MARKS TO THE BINDING OR THE TEXT. D.J. IS FINE AND IS NOT PRICE-CLIPPED. A BEAUTIFUL CLEAN, BRIGHT, UNFADED COPY WITH NO REMAINDER MARK. . Condition: FINE IN FINE D.J. Riverside, New Jersey, U.S.A.: Simon & Schuster, 1988. Book. Near Fine. Hardcover. Signed by Author(s). 2nd printing. Inscribed by Branch. Simon and Schuster, 11/15/1988. Hardcover. Like New. Signed. *Autographed by author. * Hardcover and dust jacket. Good binding and cover. Minimal wear to extremities. Clean, unmarked pages. Ships daily. New York: Simon & Schuster, 1988. First Edition. Hardcover. Fine/Fine. Hardcover in dust jacket. First printing of first edition. Book is in Fine condition, crisp and clean. Unclipped dust jacket is also in Fine condition. With archival photographs of the early civil rights movement. 8vo. 1062 pp. including index. In protective Mylar. Heavy--will require additional postage if shipped outside the U.S.
Simon & Schuster, 1988. No priority or international shipping due to size. First printing.Bottom rear corner lightly bumped, light shelfwear, dustjacket has small edgetears on front corners, 1/2 inch on top edge of spine. Bookplate signed by author laid in on front endpaper beneath the Simon & Shuster logo. Photos, notes, works cited, index,1064 pp.Text clean & tight.. Signed by Author. First Edition. Hard Cover. Very Good/Very Good. 8vo - over 7¾" - 9¾". Simon and Schuster, 11/15/1988. Hardcover. Very Good. Signed. *Autographed by author. * Hardcover and dust jacket. Good binding and cover. Clean, unmarked pages. Ships daily. Macmillan. Hardcover. 0333497007 New Condition. . New. Macmillan. Hardcover. 0333497007 Like New Condition. . Fine. New York: Simon & Schuster, 1988. First edition. Hardcover. Very Good +/very good. 8vo. 1,062 pp. First printing of the Pulitzer Prize winning biography of King. A very good plus copy in very good clipped dustwrapper. Simon and Schuster. Hardcover. 0671460978 New Condition. . New. Riverside, New Jersey, U.S.A.: Simon & Schuster, 1988. Black binding. Two photo supplements on coated paper. Numberline indicating first book club printing. Unread, as-new copy in like DJ. 1062 pp.. Book Club Edition. Hardcover. Fine/Very Good. Book. New York: Simon & Schuster, 1988. Probably the definitive history of the Civil Rights Movement. A clean, unmarked and unclipped copy.. First Edition. Hardcover. Fine/Fine. Illus. by Photographs. Octavo. New York: Simon and Schuster, 1988. First Edition. Hardcover. Very Good +/very good +. First Edition, first printing (no BOM), inscribed by author: "To Dave, with best wishes, Taylor Branch, ". Price clipped DJ is otherwiswe a strong VG+, in mylar. Book is tight and free of markings, near fine. Simon & Schuster Publishing -, 1988. PBr/pub.1988/Gd. condition/1064 pages - This text moves from the fiery political baptism of a young southern minister named Martin Luther King to the FBI and the corridors of Camelot where the Kennedy brothers weighed demands for justice agai nst political realities and the deception of J. Edgar Hoover. [KH218324]. Soft Cover. Good. New York: Simon and Schuster, c1988. Second Printing. good, good. 24 cm, 1064, illus., references, index, bottom edge of board dinged, DJ slightly worn and soiled. The American civil rights movement. NY: Simon and Schuster, 1988. Book. Good. Hardcover. First Edition. 9 ¼ x 6. TITLE: PARTING THE WATERS - AMERICA IN THE KING YEARS 1954-63 AUTHOR: TAYLOR BRANCH PUBLISHER - (LOCATION) /COPYRIGHT: Simon and Schuster, NY 1988 EDITION: First Edition with the correct number line present CATEGORY: Ethnic, Government ---NOT SIGNED--- BINDING/COVER: Hardback with dust jacket CONDITION: (All defects if any are formulated into pricing by ViewFair Books Books. If ViewFair Books miss any defects or highlights on any book/printings, our policy is to make immediate amends to any customer): The jacket is in real good condition, the flap has been clipped in the upper corner. The book is in good condition. There is a Xmas inscription written in ink on the second endpaper. Book is without any other marks or writings, pages are clean, and book is tight and sturdy. SIZE: 6 ½ x 9 ½ (approximately) PAGES: 1064 pages BACKGROUND/DESCRIPTION: First Edition. Simon and Schuster, NY 1988. Good/Good dust jacket condition. Illustrated with B&W photos. The first volume of the "America in the King Years" trilogy. Won the 1989 Pulitzer Prize for History. With a number of archival photographs of the early civil rights movement. COMPETITIVE PRICING! InvCode 004041 ViewFair Books : E H V.
New York:: Simon & Schuster,, (1988.). Very good in very good dust jacket (price-clipped). A massive book, and rather uncommon in the hardcover first edition. . First printing. A comprehensive guide to the early years of the civil rights movement, meticulously researched. Winner of the Pulitzer Prize and the National Book Critics Circle Award. Notes, index. 1064 pp plus photographic plates. Condition: Very good in very good dust jacket (price-clipped). A massive book, and rather uncommon in the hardcover first edition. New York: Simon and Schuster. 1988. Book Club Edition. Hardcover. 0671460978 . Very Good+ in a Very Good dust jacket. Edge wear. Chip to spine's crown. ; 9.30 X 6.40 X 2 inches; 1088 pages; Original dust jacket protected by archival Brodart cover. All domestic orders shipped protected in a Box. .
New York: Simon and Schuster. 1988. First Edition; Third Printing. Hardcover. 0671460978 . Very Good+ in a Very Good+ dust jacket. Toning to pages. Shelf wear to panels. ; 9.30 X 6.40 X 2 inches; 1088 pages; Original unclipped dust jacket protected by archival Brodart cover. All domestic orders shipped protected in a Box. .
Simon Publishing -, 1988. Hardcover/pub.1988/Gd. condition/1064 pages - The author chronicles an epic of America on the threshold of its most explosive era. A vivid tapestry of our nation. [KN925041]. Hard Cover. Good. Simon and Schuster, 1988-11-15. Hardcover. Used:Good. maps the structure of segregation and bigotry...a real command of the politicking in Washington..." 6x 9.25x2.75"
1989-08-03. Good. Ships with Tracking Number! INTERNATIONAL WORLDWIDE Shipping available. May not contain Access Codes or Supplements. May be ex-library. Shipping & Handling by region. Buy with confidence, excellent customer service! Simon & Schuster, 1989-11-15. Paperback. Used:Good. In Stock. Always but with confidence. Simon & Schuster, 1989-11-15. Paperback. Good. Signed by Author. Inscription to previous owner from author on title page. Covers have shelf wear. Corners bent. Edges rubbed. Clean text. Macmillan. Hardcover. GOOD. Spine creases, wear to binding and pages from reading. May contain limited notes, underlining or highlighting that does affect the text. Possible ex library copy, thatâll have the markings and stickers associated from the library. Accessories such as CD, codes, toys, may not be included. Simon & Schuster, 1988 Illus. by Jun1006-01. Hard cover. Fine. Fine in Fine jacket Fine in Fine jacket Fine in Fine jacket Fine in fine dust jacket. NEW. No bumps, no creases, no markings. Sewn binding. Paper over boards. 1065p. Jun1006-01; 20th century; African-American; African-American Studies; Civil Rights; Ethnic Studies; General; History; Non-Fiction; Political Freedom & Security; Political Science; Social Science; United States..